no objectiviTEA: Wuliangshan: Expedition started! 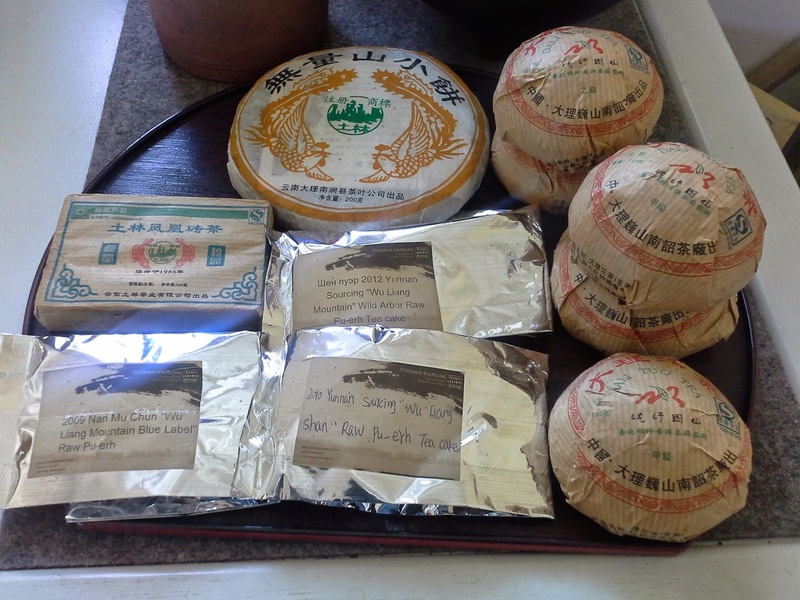 Last week, I could retrieve a Yunnan Sourcing shipment from our customs office. So now everything is set for my expedition of the Wuliangshan - my quest to find "the mountain's tea character". Is there any such thing? Will there be a common denominator to the teas from that area - still recognizable after differing years of storage and varying vintages, individual methods of processing? Loads of Wuliang Tea and 5 Tuos blended of Wuliang and Lincang Teas. 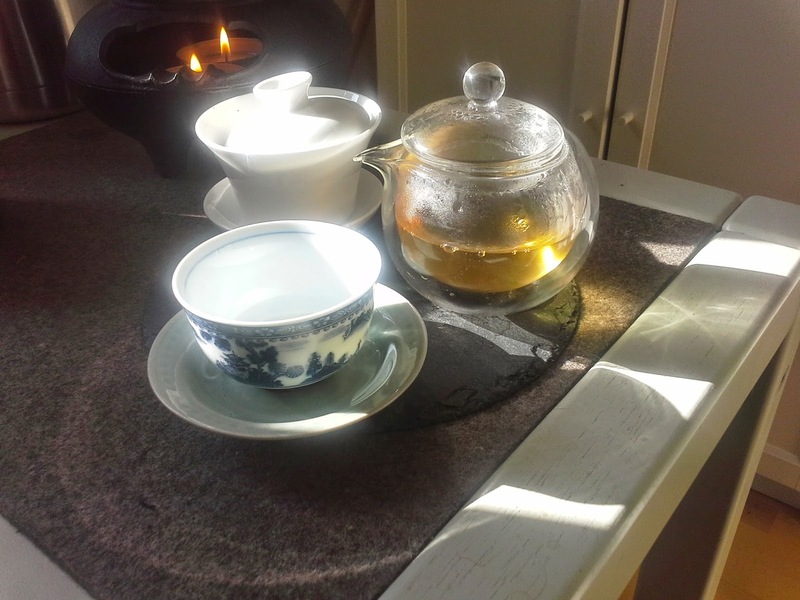 I have decided to try all the teas by the same standard: 5g to 100ml of boiling water in a neutral gaiwan. Rinse once, flash infusions up to at least infusion #5. 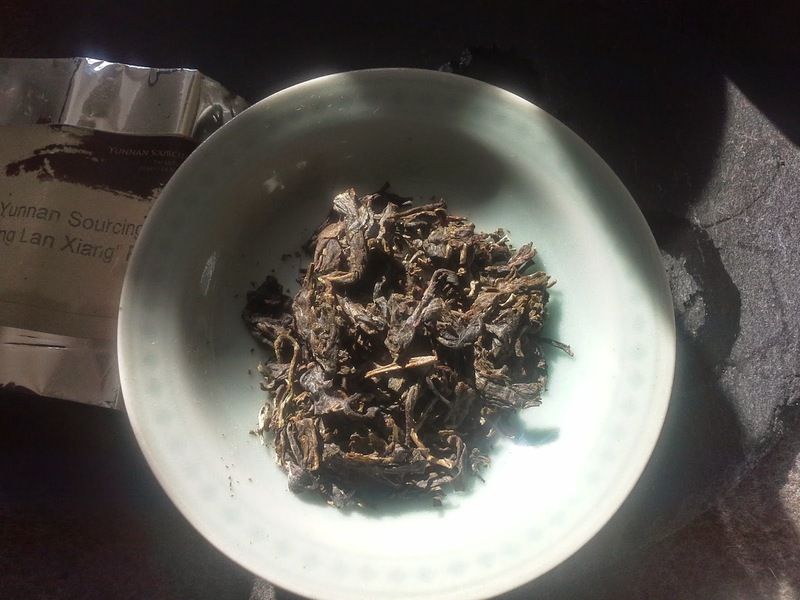 Yunnan Sourcings "2009 Wu Liang Lan Xiang" - a sheng promising Orchid Fragrance. Esteemed Reader, please be warned: this tea is sold out. In case you are prone to shopping urges, this might NOW be a good time to stop reading. Well, you have been warned. The dry leaves are pressed quite tightly, at least in my 8g sample. They have gone about half way in transforming from green to brown and give off a buttery fragrance with lots of fresh hay. Yes, there is definitely a flowery tingling in my nose - but unlike most other sheng of 6 years age there is no fruity fragrance. Upon rinsing, the leaves clearly display the fruity fragrance I have come to expect from teas of eastern Simao Prefecture: grilled bell peppers. And loads of buttery and flowery fragrances. Perhaps the grilled peppers just stood out as I was waiting for it. Sniffing the leaves later on, the flowers certainly dominate the impression. 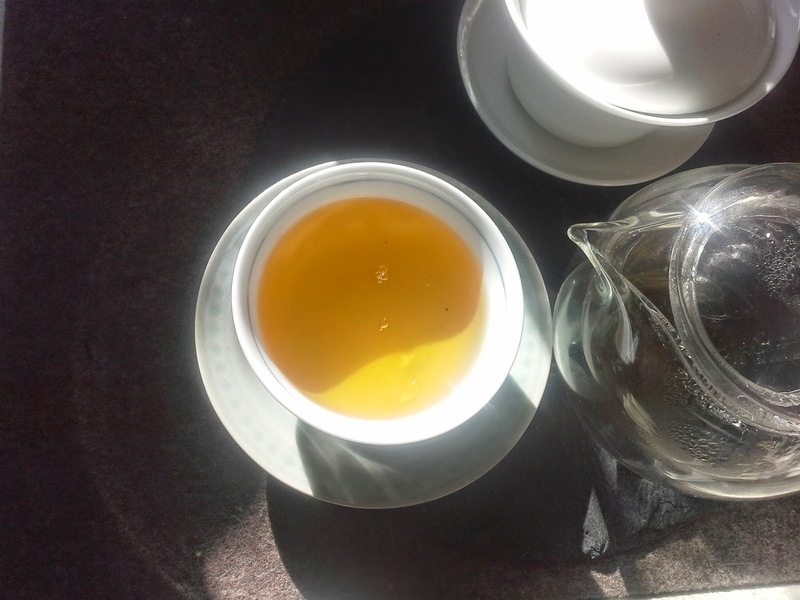 The first infusion is sunny yellow in the cup. Or should I compare the colour to buttercups? Well, "butter" is what comes to mind when the tea hits my tongue: extremely mild taste with a creamy mouthfeel. Slightly cooled, the flavour gets richer, reminding me of herbs and fresh hay. Some astringency joins in, giving a bit of backbone to the initially overpowering creaminess. The next infusions show this complementing adstringency right from the start. Amongst the delightfully herbal hay there is a full-bodied, savoury Something, which reminds me of the two Wuliang teas mentioned in my last entry. How to describe this Something? The mouthfeel is full, a bit syrupy. The flavour reminds me of mirepoix, sauteed with tomato paste and soy sauce. No - it is not like drinking gravy, but there is this savoury umami in the background. During the final infusions (10-16) the flowery taste supplanted the umami with a good helping of sweetness chiming in. The aftertaste was quite lively, changing from creaminess to a fresh & flowery impression. 1. Scott can produce some tea tremendous tea, well worth some discussions at customs. 2. Seems I have a tendency to fall in love with teas that are no longer available. Nice! Thanks for sharing your notes. I've been doing a similar exploration of Wuliang's this month :). thanks for joining in! Makes me feel slightly less nerdy if you do this too. Will we be reading about yourWuliang experiences on TeaDB? in Germany you don't have to pay any customs duties if they don't sum up to more than 5 €. With a tax of 7% on tea, you can order for 70€ (don't forget to include shipping) and end up with taxes / customs duties of only 4.90€. As this amount below 5€ does not justify the paperwork, you don't have to worry about your wallet. ... unless they get the idea to demand an analysis on pesticide residues in your private tea import. In that case you can decide: pay 200 € lab fees to get the analysis done - or have the tea destroyed. This is the risk which usually drives me nuts whenever I get the letter that my tea was delivered to customs instead of my doorstep. The customs worker told me that only green tea is required to pass pesticide residue test, black tea (what I declare pu-erh to be), does not. Yup! A happy coincidence. Look forward to comparing notes. I don't think we are drinking the exact same teas, but the bulk of my teas also come from Yunnan Sourcing.